Note: The HP of Poland is a subsidiary point at N49:10.777, E020:05.282. Its prominence is less than 10 meter. 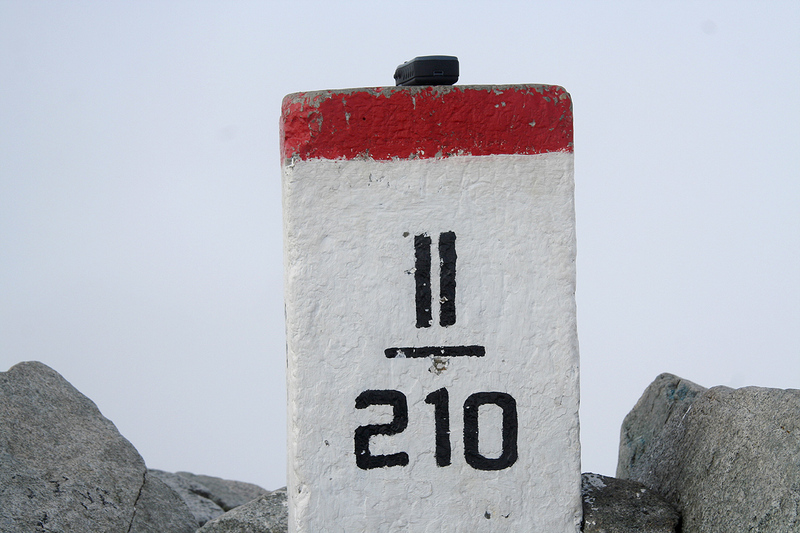 The elevation of the HP of Poland is 2499 meter. 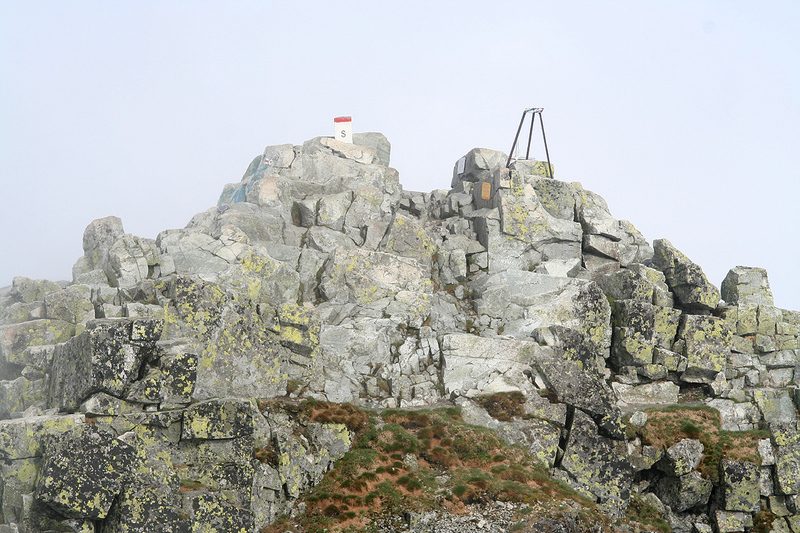 How to get there: This climb can be done from Poland or from Slovakia. From Poland, you start in the resort town of Zakopane. This report will describe the route starting in Slovakia. From Slovakia, the starting point is the resort (winter sport) village of Strbske Pleso. This place can be reached from Bratislava or Krakow, check information on Strbske Pleso for more options. Most parking in Strbske Pleso is subject to payment. We parked at a large parking lot before 0700 when the payment opens. Our location was N49:07.163, E020:03.914, elevation about 1336 meter. Route description: In Strbske Pleso, head uphill and keep right as you walk in the direction of the FIS hotel. You will pass under an arch before coming to a left bend on the road. A side road forks right at this point. 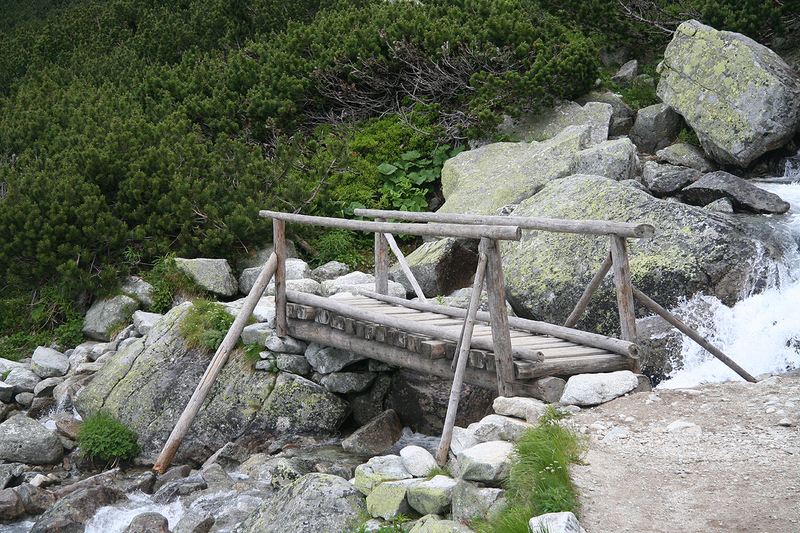 Take this road a short stretch and locate signs for a trail to Popradske pleso. Follow this trail as it initially climbs a hill, then contours along the valley that lies lower on your right side. In about one hour, you arrive at a trail fork. The (paved) road that serves Popradske pleso comes from your right and continues down a hill. There are signs and the trail to Rysy heads uphill to your left side. 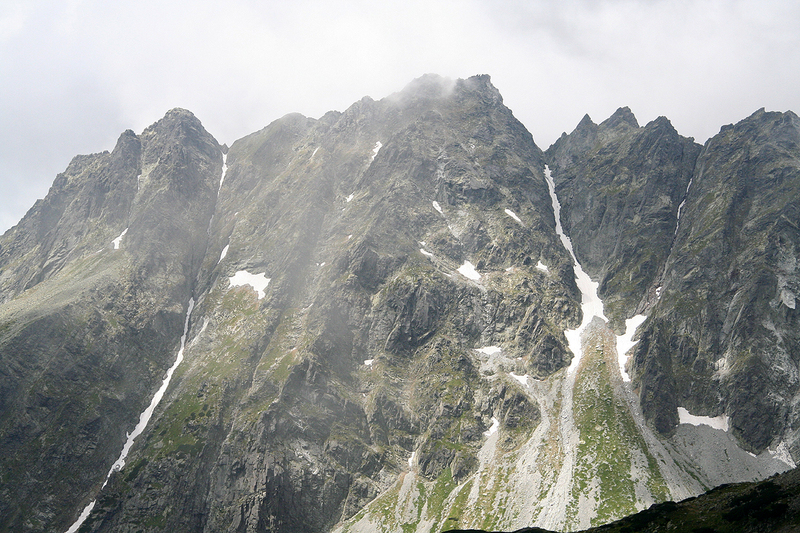 Follow this trail as it gradually climbs into Mengusovska valley. 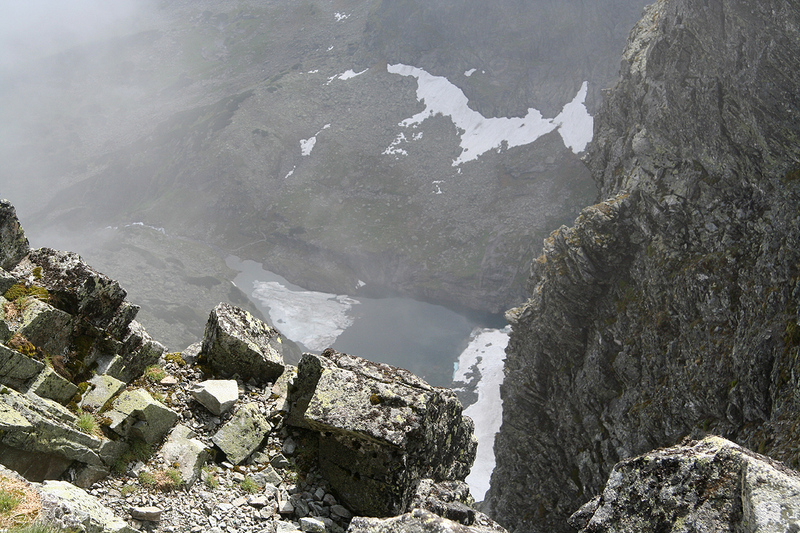 Your trail will eventually head more right, cross a creek and climb a slope to a higher basin with the lake Zabie plesa. After passing this lake on its right side, the trail turns uphill and ascends a somewhat steeper slope on your right hand side. Higher up on this slope, there is a short stretch protected by cable. 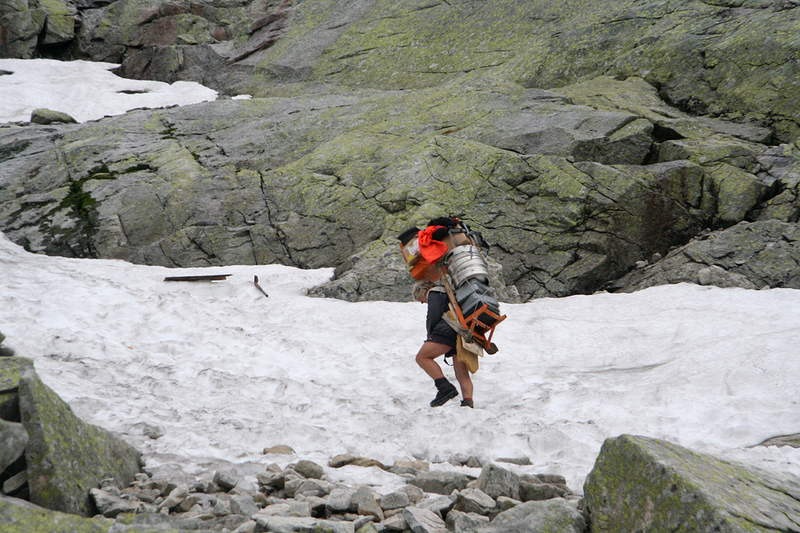 This section is not difficult, but normal care must be exercised as the drop on your (right) side is pretty steep. 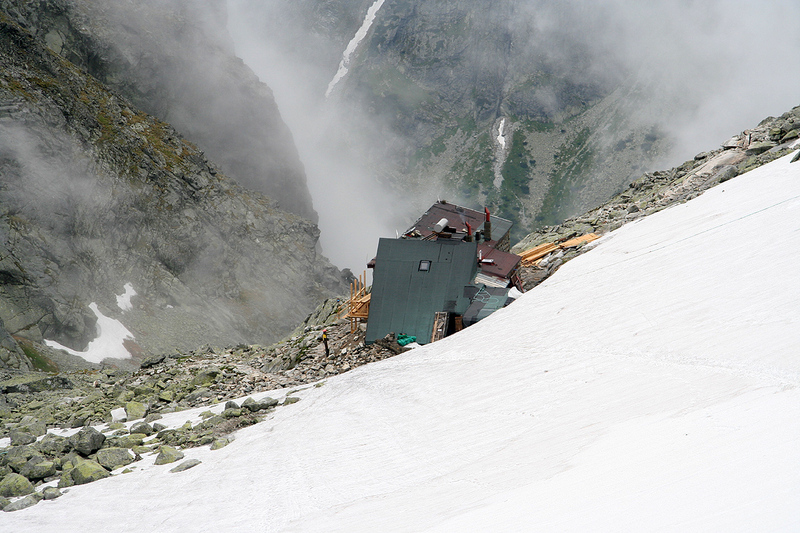 The trail subsequently turns more left again and gains a basin where the mountain hut Chata pod Rysami is located at N49:10.472, E020:05.239, elevation 2260 meter. 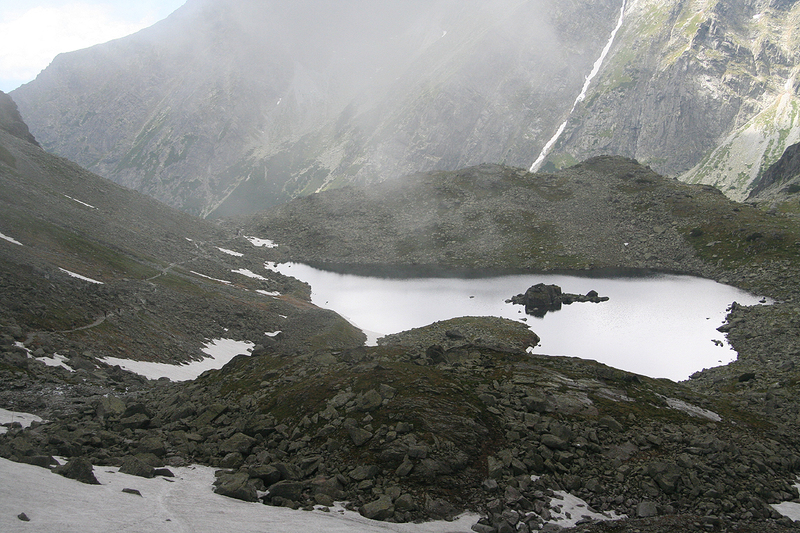 From the hut, one continues gradually up in the basin, then more left up to the saddle between Rysy and Vysoká 2547m. 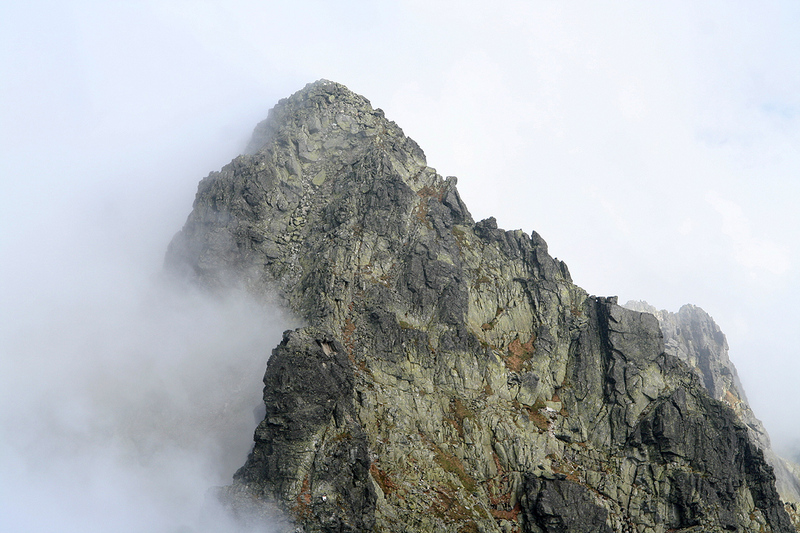 From this saddle, the route goes left up a broad ridge, then cuts across left into the face and then finds its way up to the top that marks the border between Slovakia and Poland. There is an official (white) border mark with the letters P and S painted on opposite sides. 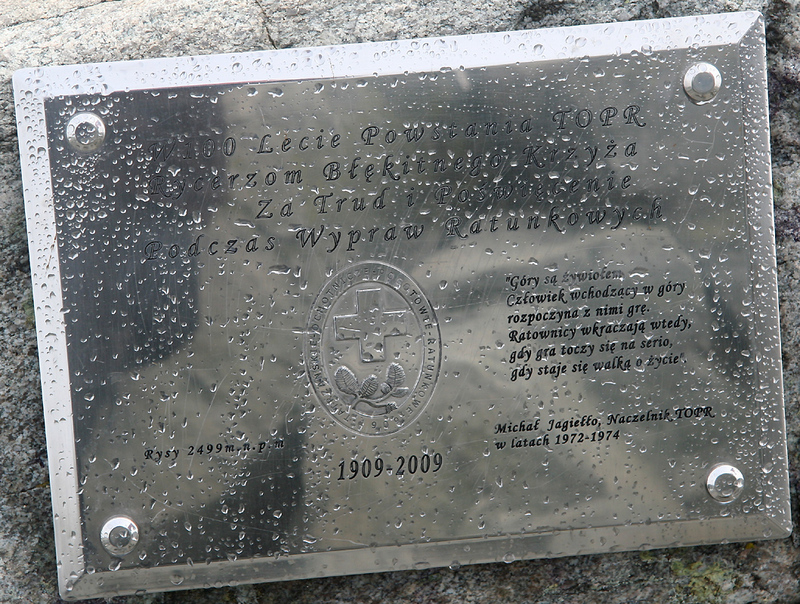 However, about 30 meter away, across a very shallow saddle, is the highest point of Rysy, approximately one meter higher than the border point. We got up at 0400 and drove across to Strbske Pleso. Many closed roads and a bit confusing to understand where we should park. There were signs saying that we should pay for parking, but no obvious place to pay. We eventually decided to park at a rather large parking lot and just go hiking. We started out around 0530 and reached the hut at 0830. 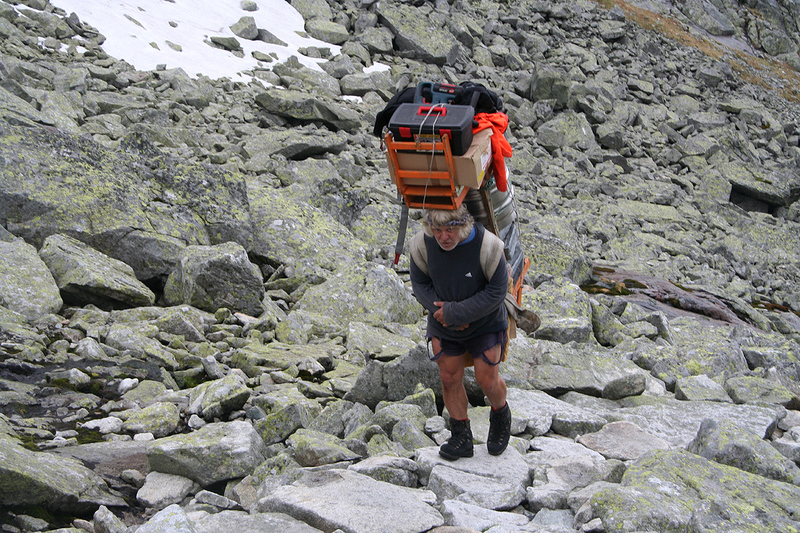 On the way, we passed a "Slovak Sherpa", a pretty old man with a load of 80 kg on his back. A two-person TV-crew came along to make some kind of documentary. We had fog and light rain most of the way. 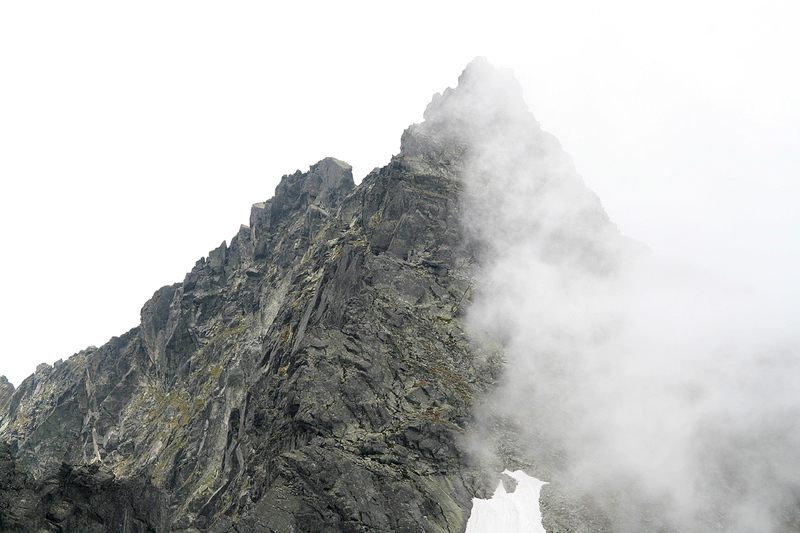 We continued without stopping at the hut and gained the summit at 0920. Interestingly, the sun broke through the clouds and gave us at least some partial views from the summit. 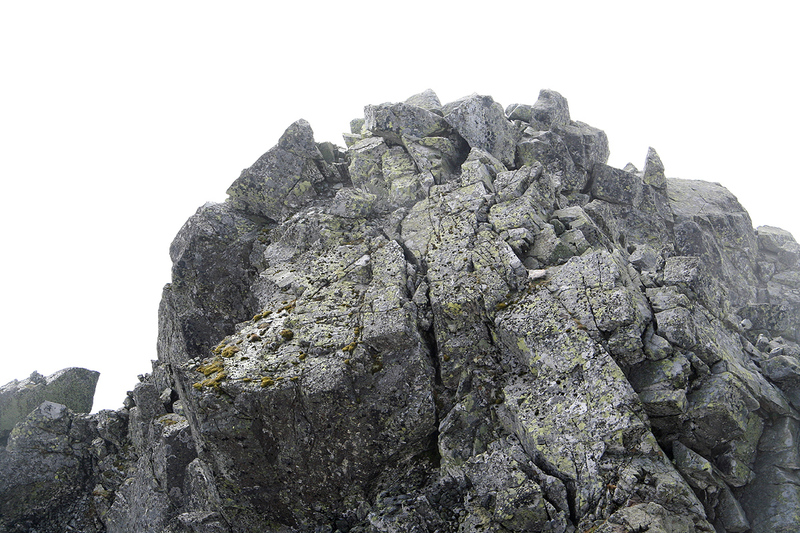 Obviously, the Slovak point only 30 meter away was higher. We decided to measure carefully. By using one (walking) pole and a half-filled water bottle (that had a painted horizontal line on it along its long dimension), we could place the pole horizontally on the highest rock. 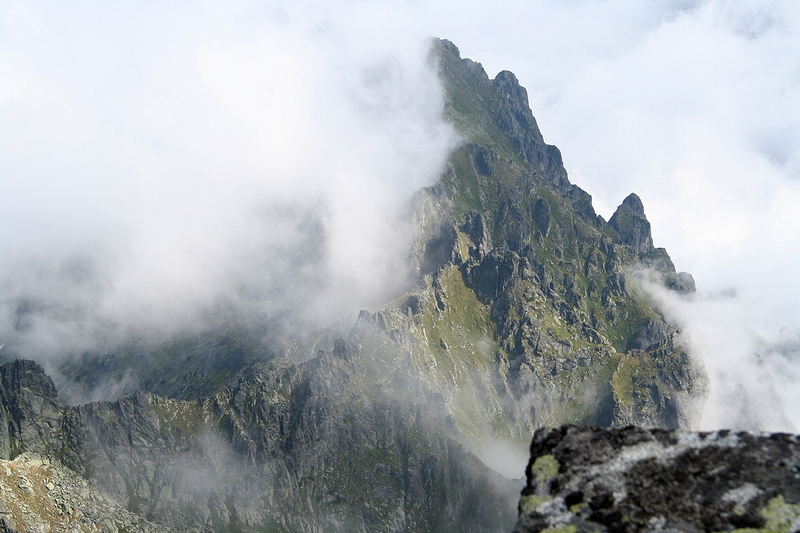 By looking along this pole, we could see that the Slovak peak seemed about one meter higher than the border point. By repeating this procedure in the opposite direction, we got a second measurement that was fully consistent. 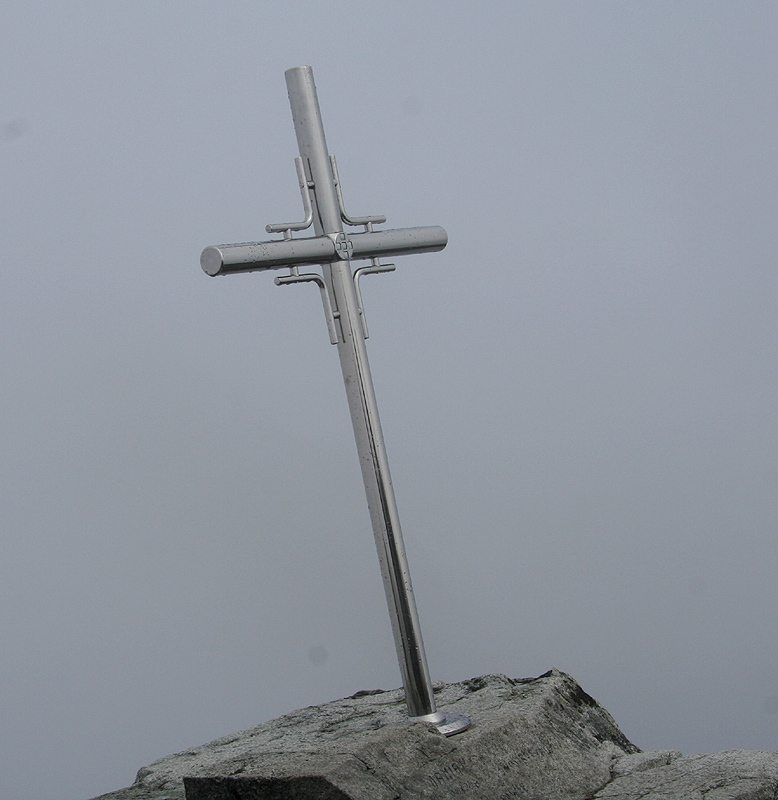 The trouble is that the border point has an elevation of 2499 meter while the Slovak top is listed at 2503 meter. One of this figures must be wrong, since the difference is clearly less than 4 meter. We left the summit at 1000 and headed back down to the hut for lunch at 1025. The hut staff was more than happy to supply quality Czech beer at the phenomenal (low) price of Euro 2 per half litre. The beer came directly "vom fass", and was carefully tapped, ie. slowly in order to get exactly the 2 centimeter of "scaum" on top of 0.5 liter of beer. 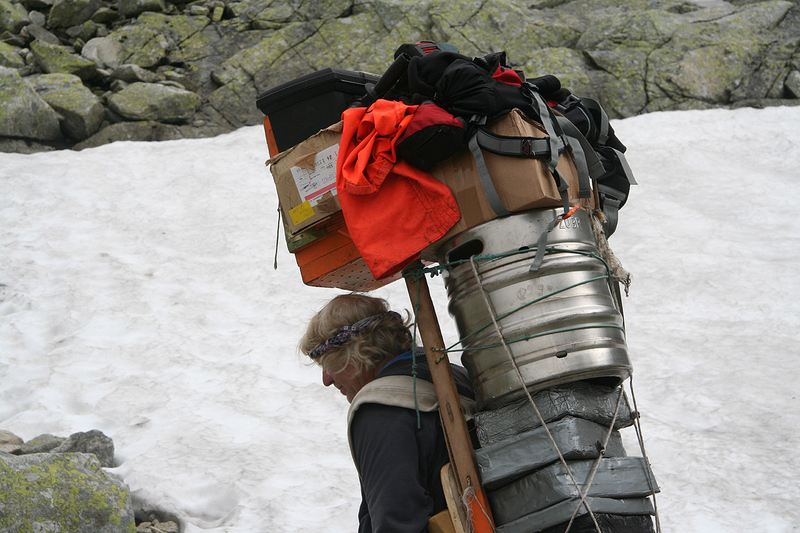 This is 2010, and the beer is carried by a Slovak Sherpa, as part of a normal 80 kg load. We left around 1100 and had a nice hike back to the car. The weather cleared and the sun came out in full force. Quite a few people were on the trail heading uphill. After meeting more than 100 hikers, we reached the car by 1320. 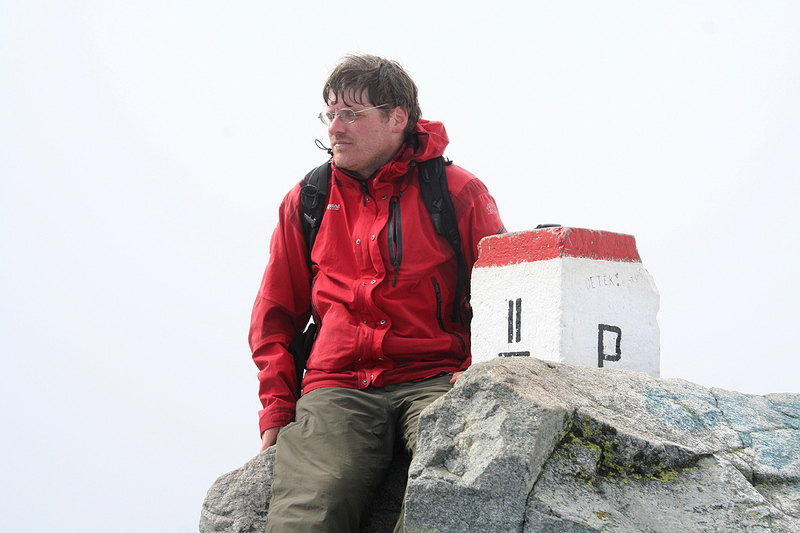 Overall, a very nice hike to a fine summit. The border, the official marker. There is a P on the right side and an S on the left side. 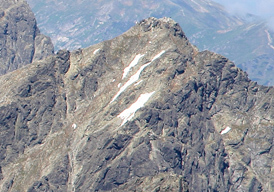 Satan, as seen from the trail to Rysy.